The Society of Collision Repair Specialists announced Monday this year’s OEM Collision Repair Technology Summit would discuss what a Texas lawsuit has made one of the hottest issues in the industry — liability for repairs not done to automaker specifications. The segment on liability from improperly repairing new technology — both materials and electronics — will follow panels on the nature of these advances and what these elements do to “once-commonplace repair procedures,” the trade group announced. “This year’s three sessions will address the impact that automotive research has on vehicle construction and functionality, the impact that construction and functionality has on performing once-commonplace repair procedures, and the impact that those OEM procedures – or failure to implement them – have on liability and safety,” SCRS wrote in a news release. 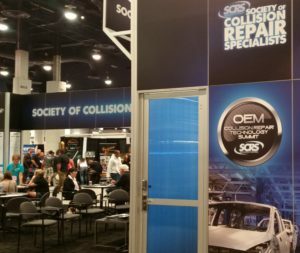 2017’s OEM Collision Repair Technology Summit will be held Thursday, Nov. 2, during the SEMA Show in Las Vegas. The potential for shop — and technician — liability arose in July, when Dallas-based attorney Todd Tracy announced the latest version of a more than $1 million lawsuit against Dallas-based John Eagle Collision Center, alleging that the shop’s failure to follow OEM roof replacement procedures led to his clients Matthew and Marcia Seebachan being trapped in a burning 2010 Honda Fit. Tracy typically sues OEMs for alleged product defects, but he’s considering more litigation against other shops. “As current litigation exposes flaws in the rationale for deviating from OEM repair procedures, there isn’t a more critical discussion to participate in for today’s collision repair operator,” SCRS wrote of the liability panel, which will be held from 3-5 p.m. Nov. 2. Ellis & Associates managing director John Ellis will moderate “The Hidden Dangers of Vehicle Technology, Improper Repair Methodology and Your Liabilities,” a discussion between “litigators, technology experts, and those with experience in facing liability and safety implications with performing repairs in today’s environment,” according to SCRS. Besides a shop’s bottom line, there’s customer safety to consider. Honda in 2015 offered another stark demonstration of how failure to follow procedures and restrictions on ultra-high-strength steel led to an Acura MDX failing to behave as it should in a narrow-offset collision. Other anecdotes from I-CAR, Collision Advice, and P&L Consultants show how failure to properly calibrate safety technology could be disastrous. Even a shop committed to following OEM repair procedures might find themselves getting tripped up on one item or another. Changes in vehicle joining and substrates might leave a shop scrambling to buy expensive equipment, and even seemingly mundane items like disconnecting a battery, aligning a wheel or replacing a radiator core support can have unexpected complexity. And just when you’ve got everything down pat, the OEMs or regulators change the technology again. For these reasons, shops shouldn’t miss the first two panels of the summit either. At 9 a.m., SEMA’s own vehicle technology Vice President John Waraniak will moderate “How Automotive Research is Driving Change in Vehicle Design, Technology and Function,” featuring a discussion on “the research going on today that has the potential to reshape how you repair vehicles tomorrow,” according to SCRS. At 11 a.m., Hunter Engineering senior product manager Kaleb Silver will examine “the impact of advanced systems on routine services such as wheel alignments” during “The Impact of Advanced Vehicle Systems on Routine Repair Process and Procedure” building off lessons he delivered to the industry earlier this year. There’ll be a panel as well. SCRS began hosting OEM Summits four years ago to put repairers and others “in a room with innovators in automotive structural design and technology that can create context around sophisticated advancements in vehicles and emerging technology, and the impact it will have specifically on collision repair businesses,” and you’ll want to take advantage of that opportunity. The sessions are part of the SCRS Repairer Driven Education Series Oct. 30-Nov. 4. Register here for the individual classes or the series pass package deal, which includes the entire week of classes, all three parts of the OEM Summit and the Nov. 2 Sky Villa afterparty. Space for the OEM Summit is limited, and early registration is encouraged. Details: www.scrs.com/rde; www.scrs.com; 877-841-0660; or info@scrs.com.